Cool little thing and i was completely uninformed of quick charge specs for USB as well, so thanks for showing. It´s probably quite versatile for use in vehicles or outdoor in general. In cars most cable connections should be crimped instead of soldered, but anyway... if you need to fix something and know what you are doing this thing might perform quite well. I do have a propane/butane heated soldering iron, where temperature can only be guessed and it does blow out the hot gas next to the tip, therefore can not be used in tight spaces. So I guess a good temperature control might be important not to get over the melting point of several plastics or parts. So i am one cigarette lighter adapter away from getting one. Can you test if the TS80 is ESD "safe" without the strap? Any mains leakage to earth through the tip? Pretty sure I've killed some components with the TS100 because of it. U guys mention the QC protocoll. Is it really needed with communication for this iron? What i can see in the video Dave only connects it to a bench power supply and it powers up without any communication? Any way I have ordered one without power supply. Thinking of connecting it to a smaller LIPO pack with apropriate boost controller. I know there are ones to buy but i already have some LIPO packs laying around. The TS80 is powered from USB using Qualcomm's Quick Charge (QC) 2.0 (and up) fast-charging standard (9V @ 2A). 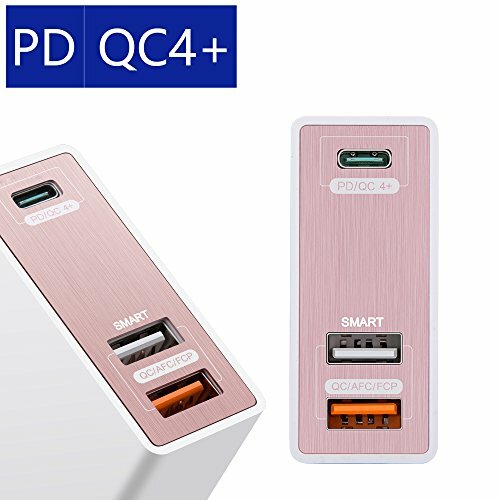 You need a USB powerbank or a USB charger which is QC capable. Trying to power it from anything else will be difficult! If you want to use a LiPo pack you should look at the TS100 instead - Dave will upload a review of this very soon. It should be the same as the TS100, if you do not have a grounded output supply or grounding strap, you can get leakage current through the isolated supply. There is really no way around needing to use the grounding point. Using a USB power bank should make it safer, but any sort of AC USB power adapter is probably going to be isolated, having only a 2 prong plug. That is definitely a trap.. they should include the grounding strap by default. @Dave I'm going to make the question here too, since the new video post is all about the fanboy:ing etc and maybe you didn't see my question, could you measure or take a photo of the tip next to a ruler, I have access to a Weller micropencil that uses the RT tips and would like to know if the tip could actually fit by unscrewing the barrel part from the TS80 *(or maybe cutting it shorter), I measured the RT tips to be about 14mm from the root of the 3.5mm jack to the fingerguard/handle and about 6-7mm thick. also from google I can see people have found that the pinout of the RT tip is, tip of the jack is the heater +, the middle is one of the thermistor and the base is the common ground. Have you done any changes to the firmware or is it stock? Someone please confirm or deny the Weller RT tips compatibility already. Really wondering if those tips are compatible. Upd: I totally forgot Marco Reps has measured the TS80 tip in his video (5:50) and it's doesn't seem to match Weller-RT pinout. Got TS80 today. Doesn't even turn on with Xiaomi 65W Type-C/Type-C PD Laptop adapter (CDQ07ZM), so beware. Works well with various cheap QC3.0 adapters though (namely ORICO QTW-1U and its own DNQ18U-U). Looking for 65W PSU that supports both laptops and this iron, tell me if you know one. Community firmware and stock firmware 1.06 are available now. The TS80 is NOT USB-PD compliant (the CC pins required on the USB-C connector for Power Delivery are not even connected). Instead it is only QC 2.0 or 3.0 compatible. Talking of which, I couldn't find a list of compatible power banks for the TS80. Some have auto-turn off features that make them unusable with the TS80. My grain of salt: I just bought myself an Anker PowerCore Speed 20000 link which seems to work pretty well with the TS80. It has an auto-turn off of 2 minutes when the soldering iron is not heating (I think this is acceptable) and it supports QC3.0 in and out. The only downside is that it doesn't support power pass-through (you cannot charge anything while the power bank is charging). Didn't trace, but CC pins might be connected through vias. I guess PD still requires a few more hardware components even with software bitbanging. You'd need A-C cable anyway. TS80 doesn't work with C-C cable even in DFU mode. Generally everything C-C is PD, everything A-C is QC. Supplied chisel tip is 2.5mm wide. I like to get 1.6mm or 2.0mm variant in future. About 59mm between tip end and iron body. Supplied USB-C USB-A cable doesn't have shield connected between connectors. Total resistance (including connectors) seem to be about 220mOhm. And yes, it is very flexible cable. TS80 can be powered with laboratory powersupply outputing 9-10.4V (depends on resistance of heater element). This voltage range to stay within 24W as I have no idea how high power the heating element can survive. Iron's input voltage determines used power as heating element is just which on/off (pwm or pfm? - I haven't checked which one with scope) without voltage conversions. The Power setting in Iron's setup menu sets voltage it will request from QC 3.0 charger. (QC3.0 allows voltage requests in 200mV steps). So: Iron doesn't mind if input voltage is continuously 9V and doesn't drop to 5V while in stand by. Resistance of my heating element has measured 4.61 - 4.66ohm (power on TS80 and long press left button while in "start menu" and Iron will measure resistance). I am using Blitzwolf BW-S5 USB-A QC3.0 charger. With 24W setting TS80 takes about 10.26V (powersupply end of cable) and about 2.2A max while heating, varying between 21-23W from my BW-S5. This heats tip 24C -> 300C in 14-16s. [Edit: corrected 320C to 300C] This charger increases voltage to compensate cable loss, so output is 10.14V at below 0.1A. Even BW-S5 charger is Qualcomm Certificated, there is some timing or communication issues resulting low voltage error on TS80 screen and requiring rebooting TS80. Sometimes high voltage doesn't start fast enough or low voltage starts too soon. These happen when TS80 tries to transition from 5V to 9V or back to 5V. There is no issues while TS80 is in heating/soldering mode. 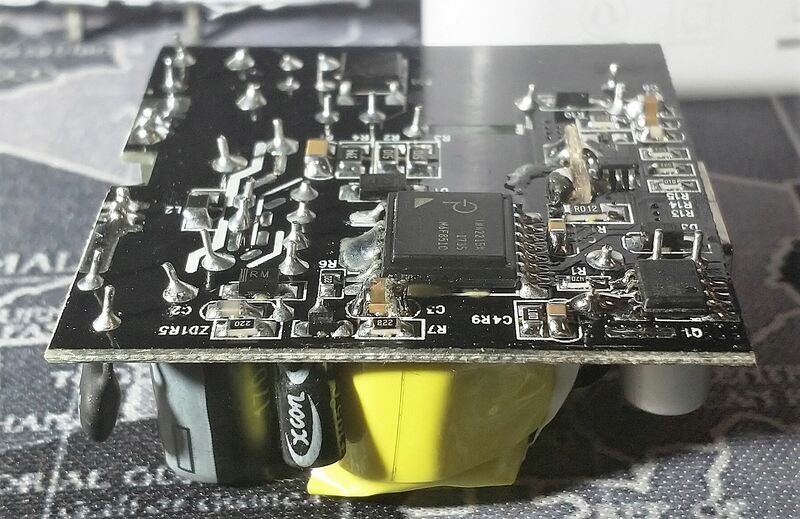 These issues do not happen with Blitzwolf BW-S9 as psu, but its output voltage measures lower and it is not rated for above 18W power, even it outputs more. TS80 takes about 19-20W at 24W setting when using BW-S9. After calibration (or should I say alignment?) the 18W power and 320C temperature setting measured 320 +- 1C with Fluke 87V with its supplied K-type probe while only probe touched tip. I didn't do long test, so I don't know how electronics heating up will affect. Test was done just after receiving TS80, so I don't know if power setting or all playing around has changed calibration. Supplied ground wire is a bit annoying. It is stiff, specially spiral in cable. They should have made supplied usb cable have also shield and connect it to Iron end connector shield and separate it at power supply end to another connector for grouding. I might do my own cable. I have not tried supplied psu. I didn't bother to search an adapter to plug it in EU socket. I do FPV flights and normally carry lost of 12V and 16V lipo batteries. I was looking towards buying a TS80 to carry with me to the field, but found out that for field use I'd need a QC 3.0 battery. Which I do not have! I was wondering if I could prepare an adaptor from Lipo XT60 plug to a USB-A plug and use 12v 3cell battery! But, from what I see, there is no certain answer! For exabple oh2hyt says, he is not sure how much power the heating element can withstand. This surprizes me, I thought the electronics of the TS80 could regulate the power to feed to the heating element. No? What I read from elsewhere, TS80 electronics (I'm not talking about heating element now) will die at about 16V. I have not tested, so don't blame me if it dies at lower voltages. Normally TS80 will use QC3.0 (or QC2.0) protocol to regulated input voltage ie. maximum power/current to heating element. Also it has software over voltage protection which voltage you can set in menu (maximum setting is 13.0V, I would set it to below 11V). TS80 will shutdown at that voltage, but it won't protect electronics! That is a constant current driver/regulator. It does not work with TS80. Constant current = output voltage can be (almost) anything to keep set output current. You would need constant voltage, a voltage regulator, to output 9V converted from your battery voltage. Also when playing with batteries some battery protection is good to have: a fuse to limit current in case of shortcircuit and a low voltage protection/alarm to not over discharge battery. Usually Lipo-packs do not have these protections build in. Have you considered TS100? People use it directly from Lipo batteries. I don't have personal experience of it and I'm not sure what input voltage it accepts. Forum search should find topics about that. Maybe someone can help me? There is no circuit yet, but I really need to know the parameters of this capacitor. My TC80 is dead. Help me please. 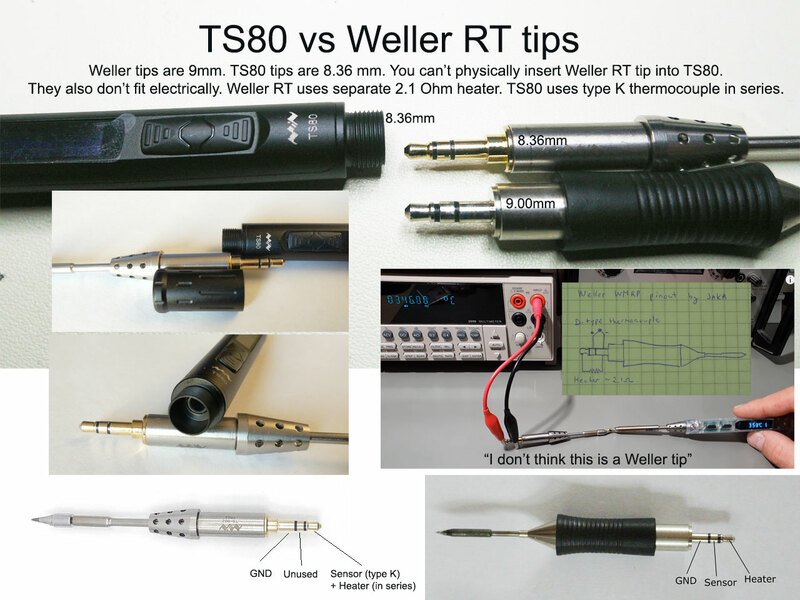 A little bit more info regarding Weller RT tips, from Rossman's TS80 video comments. What the hell really? I swear there's no PD protocol support in TS80. Either the charger is not PD-only (which is kind of unusual, I've never heard of QC+PD combo with a single C-C cable) or "tested" means TS80 doesn't work with this charger. In theory it should work with the ts80 too. You used the usb c cable that came with the charger, which is "unmarked"(no E-marker). The charger doesn't output voltage when nothing is connection conforming to usb pd standards. So maybe the charger just think nothing is connected so using a different cable would work? can anyone test this?